The new Superman film, Man Of Steel, follows the "realistic" example of Christopher Nolan’s Batman films, according to writer David S Goyer. Nolan’s Batman movies were successful in using the essentially simplistic material of a comic-book superhero and fleshing it out with complex and very human themes. That is the same route that Goyer and Nolan have followed with Man Of Steel. Speaking at the Rome Film Festival, Goyer said, "What Christpher Nolan and I have done with Superman is try to bring the same naturalistic approach that we adopted for the Batman trilogy. We always had a naturalistic approach, we want our stories to be rooted in reality, like they could happen in the same world we live in." Goyer wanted to elevate the material beyond the "cartoonish". "Working on this reboot, we are thinking about what would happen if a story like this one actually happened," he said. "How would people react to this? 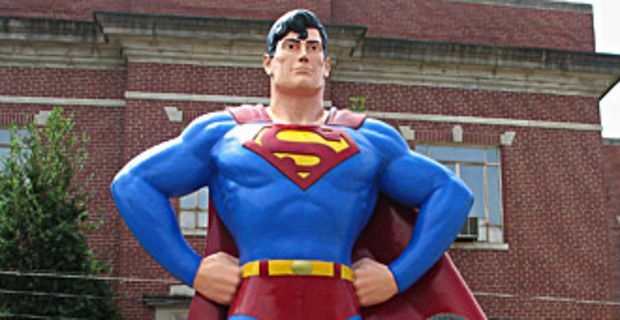 What impact would the presence of Superman in the real world have?" Man Of Steel stars Henry Cavill as Clark Kent and (spoiler alert for those unfamiliar with the basic storyline) Superman. "It's a modernisation of the character and a very realistic view of one, obviously, very fantastic individual," Cavill told Cineplex. "It's an unreal situation, but it's approached from a very practical viewpoint. We wanted to make the character easier to identify with." Amy Adams plays Lois Lane, with Russell Crowe as Jor-El, Superman's father. Kevin Costner and Diane Lane play his adoptive parents, Jonathan and Martha Kent. The film is scheduled for release in June 2013.